The education world overspills with thrilling sounding initiatives — from ‘flipped classrooms’ to one-on-one tablets; from forest learning to discovery-based learning. Each new innovation is jumped upon eagerly by hoards of school leaders and education consultants keen to try on the emperor’s new clothes. Yet one of the most powerful influences on learning is so simple and unfashionable that it is often overlooked: a teacher’s capacity to explain things clearly. In my view, this explains the issue with fads in education more than it makes a solid argument toward rejecting the principles of progressive education (after all, explaining things clearly is not beholden to a traditional mindset.) However, the serious problem of corporate- and capitalist-driven initiatives in the education sphere is a constant threat which deems to undermine any progression toward transformation practice. At the Deeper Learning Conference 2016, the featured concept was avoiding the plight of an extinguished or lightly kindled flame of prog. ed. — instead we must ignite and brightly burn our fire. And one of the greatest threats to incorporating PBL, growth mindset, critical pedagogy, and ed-tech are the companies who invest so highly in the surface-level widespread proliferation of these concepts, being sold at outrageous prices to unsuspecting schools. PBL: Project-based learning: real world challenges and projects. PBL: Problem-based learning: the same thing, but is centered around an open-ended problem. CBL: Challenge-based learning: the same thing, but with a framework for progressing through the previous two concepts. SBL: Service-based learning: project-based learning, but with a focus on empathy. CBL: Community-based learning: again, but now with an emphasis on connections to the community. PBL: Place-based learning: the same as community-based learning. LBL: Land-based learning: the same as place-based learning. DBL: Design-based learning: Learning through the design process. ELT: Kolb’s Experiential Learning Theory: Learning through experience and reflection. There’s actually many more of these, but this is enough to show the dangers of a fad. I recall attending an event a few years ago and being pitched “challenge-based learning” as the quintessential way to teach a classroom, starting with about an hour of solid pedagogical framework, followed by an absurdly priced site-wide curriculum guide. Almost every veteran teacher in the room rolled their eyes and took to their phones, but new teachers were honed in — keen on embracing the latest and greatest concepts for their students. Years later I’m sure they will have moved on: they have heard and been promised the same concept again and again. Instead of building upon progressive practice, we’re just customers in the machine. Of course, each idea above is usually attributed to John Dewey and experiential education, a theory from 1938 which says the same exact stuff.Sometimes the new practice introduces a new, slightly helpful idea (e.g. the design process for helping to organize a project), and others simply replicate older works and claim it as their own (Kolb’s Experiential Learning.) This wouldn’t be a problem if the intention of each program was to help students learn. It’s unlikely that each creator of a “learning process” was profit-driven, but there’s no denying that their ideas were soon devoted to making money. A quick search for any of these concepts will land you with pop-ups for new books, consulting, frameworks, curriculum, posters, plans, and more. Each promises a radical transformation that only their product can offer. Each tends to use one “famous” educator to sponsor them (an “edu-guru”) or misconstrues research to support their cause. Although there’s nothing implicitly wrong with wanting to make money, these fads play off the ignorance of school leaders who want the best for their students but don’t have the pedagogical knowledge to “fix” what they deem wrong. Teachers are usually forced to attend the latest fad at a conference, sometimes multiple times a year, and then implement those ideas to the classroom. Because these ideas are surface-level, wastefully rolled out, and so commonly a marketing tool rather than for actual teaching, they fall short, kids suffer, the school loses money, and teachers double down on traditional practice. This lessens the seriousness of how progressive education should be viewed — because any skeptic can point to these problems and have a convincing argument that prog. ed. isn’t rooted in reality. Quotes like James Tucker’s are almost true, and educators will band together to reject any perceived as “new” ideas. Hence why prog. ed. can be associated with “hippie-style” educators who aren’t grounded in substantial research or “real” practice. So then the question becomes: what can we do? Outside of convincing school leaders that it is almost never worth it to invest in a standardized curriculum (after all, experiential learning doesn’t have a standardized curriculum — like most progressive practice it’s a mindset, not a step-by-step), we must promote free, open-source, and reputable voices that are willing to speak for the betterment of schools. It’s fine if people want to promote their work, but when we’re impacting the lives of human beings it becomes incredibly difficult to rationalize keeping the “secrets of education” behind a paywall. In the same vein, we must be diligent in agreeing with traditional educators when they share their disdain for fads in education. We must ensure they know we’re with them that inventing new acronyms isn’t helping anyone — except we offer that progressive education is rooted in research, theory, and history. This may not change anyone’s mind, but it will at least frame the argument around solid pedagogy rather than defend a problem we both take issue with. With so much focus on students finding their purpose in life, it’s worth noting how little teachers consider their place. The initial response is usually — “Well, my purpose is to educate children for a better future.” — or varied platitudes — but so many have ventured from this trail. Instead, they’re left anxious, depressed, and generally discontent at the system they’ve found themselves in. Of course, this is due to relatively low wages, lack of administrative support, being treated as a less-than-expert profession, ridiculous accountability measures and more — but I argue the penultimate reason is lack of purpose. Just as students lack meaning in their classroom assignments, teachers lack meaning in their positions. Finding my purpose in education was born out of an immense frustration with education itself. After night after night of cramming lesson plans that paired perfectly with standards (and “differentiating” with the latest tech tool), grading 80+ assignments, and becoming increasingly frustrated with students forgetting everything I told them, I began to wonder why I even bothered. I drank more, I was increasingly negative and irate, and I lost much of the drive I entered the profession with. This wasn’t because I didn’t realize my purpose — I knew that I wanted to help children learn — to inspire and guide them — but my position wasn’t actually doing that. Instead, my purpose was to prepare students for a test that gauged their worth and mine. Everything I was doing was ultimately tied to maintaining a faux sense of control over my situation — reenacting what I was taught and believed was “good teaching” or in other words, great compliance. Then I went down the rabbit hole. I decided to take the plunge — I walked in the next day, threw out my lesson plan, and surveyed my students for what they wanted to do. We wrote it all down together. We developed the lessons and projects. They were motivated and I finally felt connected to the classroom experience which I dreamed of. In fact, every single struggle that I assumed would occur: lack of motivation, things falling apart — never happened. The quickest concept to disintegrate was the outdated system I used. From there, I experimented with every progressive idea I could find — we began to submit work to portfolios, self-assigning a grade (eventually, just throwing out grades altogether); we took breaks and cared about our mental health; we reached out to the community and developed authentic work. In each endeavor, I felt more alive and less stressed — not only did each of these practices revitalize students, they were easier to do. No longer did I have to spend all my time at home thinking about planning and grading. I did not have to execute a perfect lesson plan and stay on top of time management — angered at any distraction (such as an interesting question to drive us “off track”). Now, I spent almost 100% of my time at home, relaxed and content, maybe contacting an expert or reaching out on social media for guidance. At school, I was more engaged —expelling all my energy to work and listen, rather than discipline and coerce. With more free time, I started to do what I loved outside of school again: music, writing, gaming, coding, reading — and it made me a better educator. I could connect with students as a person. I wasn’t a robot who only had one interest or objective — I am a complete human being with passions, loves, faults, and challenges. And now, I could communicate that. I could relate to students better, and I was happy. Not to mention, I could share and connect my loves to student projects — developing deep, meaningful work. At the top of the Human Restoration Project Twitter page, I placed the banner “Discover Your Purpose.” But the more apt directive would be “Rediscover Your Purpose.” Anyone reading this cares about kids. We went into this profession because we wanted to inspire the next generation — and they depend on us to do so. Taking the risk of rekindling that lost spirit of education is worth it to yourself just as much as it is to them. Students no longer receive a grade. They automatically pass. In an era where failing a course could have massive negative life implications, I could no longer justify even a simple pass/fail mentality. At school, we have frequent assessments and I spend the majority of my time in 1:1 or small group conversations to help students understand concepts. Much of our work is devoted to critically analyzing topics and discussing them, and students have higher grades than ever before (as I still keep track on the back-end, that are never reported.) Students have increased motivation, potentially due to the lack of any weight on their shoulders, they’re more willing to take risks, or because I spend so much more time checking in with them. A grade is no longer a substitute for great feedback. When I go home, I rarely spend anytime thinking about grades. I rarely report anything to the office anymore. Discipline problems, in general, don’t happen because the majority of my problems were due to students not complying with what I wanted them to do. Obviously, if you do what interests them, students rarely act out — and if they do, you now know there’s something much deeper at hand. I’ve been able to establish deep relationships and get children the help they need because I now care about their learningrather than what I want them to do. Nothing is more empowering or meaningful to me than diagnosing and dealing with significant problems beyond the classroom for my students. When I first started teaching, I assumed I was a master of student choice. Whenever I gave an assignment, there was a list of at least three pathways, each with a different means of expression (“Draw this!”; “Make a PowerPoint!”; “Take a written exam.”) However, real choice was the moment where I literally let students do almost whatever they wanted. On paper, this sounds like an insane suggestion: won’t kids go crazy!? In reality, when I told students, “Here’s what I think would be cool today, but feel free to opt out and do something. I’d prefer if it had something to do with ‘x.’” 99% of the time, they would agree to do what I asked. I must note, I allow for choice not because it makes compliance easier — but that doesn’t mean it hasn’t. Kids want freedom. If you treat them like young learners and present information that’s relevant, interesting, and optional, they almost always surround you. And if on that day they’re not interested and do something else, they likely wouldn’t have listened regardless. In addition, although I don’t necessarily care about this outcome, it’s worth stating that my test scores went up. Because we tackled more complex situations and I cared more about individual learners, I’d guess that many were more comfortable within the logical analysis rows of tests — even though we covered half as much content. Administration seemed to care a lot less about my “radical” ideas after seeing the results. Through all of this, I felt initially I was doing something wrong — after all, much of this seems counter-intuitive: students doing more without being held accountable by grades; letting students choose to learn makes them more prone to learning and less likely to act out. But it shouldn’t be a surprise. As I mentioned before, research is on the side of progressive education. Real learning outcomes: motivation, inspiration, and curiosity — are shown time after time to be driven by these practices. We trust science is almost every endeavor, it seems odd that we wouldn’t think the scientific outcomes are realistic. All that said — find your tribe, your support network. Have them coach you through this process. Rediscover your inspirations and passions for learning. Spend time with your family and friends again. Rekindle who you were before education started to steal your soul. It’s time to be a great educator. I believe in hard work. Had to. We didn’t go to church on Sunday. We worked on Sunday. Work was our worship. When school was out, work was in. Every weekend, every break, every summer, there was work to be done. So, we worked. And while I didn’t always appreciate the lessons from work when I was younger, I proudly acknowledge the impact they had on shaping the person I am today. Hard work matters. So, then, one might think that I sell such wisdom to my students. Well, yes and no. I certainly sell the benefit of work. Work pays off. But I only push the work that produces a meaningful end. Hay in the barn means fed cows. Wood in the woodshed means a warm house. Milk in the pail means milk on my cereal. As a young man, I could see the benefit of my work, could feel the benefit of my work. But not all of my work. See, I had other work, too. Work for which I found little meaning, from which I took little benefit; work that took my time away from other work or — even more — those few fleeting moments of freedom when I might have gotten to enjoy kidhood; work that seemed to serve no greater end than my having something to write on the test. For that’s where I would leave it. It filled no barn or shed. It filled the grade book; it filled time; but I am not convinced, in the end, it filled me. Oh, I suppose the argument can and will be made that such work, homework, fostered and nurtured my growth as a student, that had I not done the work I would neither have gotten through nor made it to where I am today. Okay. Maybe. I guess some things may have stuck to me along the way. I won’t argue against that, but I won’t argue fully for it either. For if they all had stuck, surely I could find them now. But try as I might, I cannot collect such things from my memory. I guess adding, subtracting, multiplying, and dividing stayed, but danged if I can find that quadratic formula or geometry proof hanging about. One would think after all the work I had done on such things they would be constant companions. We spent hours together, but I can’t find them now. It’s like we never knew each other. Please know I am not purposefully picking on math here. I could pick on any subject, even my own. It’s just, for me, math occupied a lot of time and effort for which I, personally, found little return. I am sure many could/would say the same of language arts. So, then, what’s my beef? Oh, not sure it’s a beef as much as a belief. While I do believe in the benefit of real, honest work, I do not believe in work that seems to serve little end. And so, I do not believe in homework. Wait, before you pounce. I do believe in practice. I do believe in repetition (took me a lot of repetition to get to where I could efficiently milk Betsy). I do believe in struggle. I do believe in perseverance. I do believe in doing. I do believe in, “if it’s not done right the first time, then you have to do it again” (fence posts need to be in a straight line). And I believe we get out what we put in. I believe all of this. I do. I just don’t believe the work of learning in my classroom has to happen outside of school. So it doesn’t. I don’t give homework. Am I anti-homework? I’m not sure that’s the best frame. I am pro-learning, and I am not convinced that the vast majority of work we assign outside of class promotes learning as much as we think it does. If I am honest — and I will be — most of the homework I used to give was to fill time, to fill the grade book. I scored it, but I did not assess it, which means I did not give feedback. Basically, kids did it, and kids got points, and in my “mean years,” I punished kids with penalties when they didn’t do it on time, and I struck them down with zeros when they did not do it all. In those days, kids were doing, but I am not sure kids were learning. And so, slowly, I began to give less homework, focusing instead on the work in class, where I could give feedback instead of scores, where I could give help instead of headaches. Headaches? Well, not literally, of course. But we all know the stress homework causes kids and families. I see it. I hear it. I lived it then, and I live it now with my own children. And I decided I did not need to contribute to that. And so, I no longer do. These days, I am a helper, not an assigner. And I have found that my best help comes when I am with my kids, face-to-face, working together. Do I cover as much content as some? Not even close. But I came to grips with the realities of coverage versus competence a long time ago. I will not get through everything in a year, which is probably true homework or no. But I will get through to every kid in a year. No, I did not say that I will get every kid to standard, but I will help them work and grow, right here where I can do it best: in my room. Work matters. But the right work matters, too. I will not go so far as to suggest that homework is the wrong work. Nothing is all right or all wrong. But I will suggest, whether it’s work at school or home, there is better work. And as we work with our kids, I think we could all be more mindful of the type of work we do with them. In the end, I don’t think people — young or old — are afraid of hard work. I just think they are neither motivated nor inspired by work without a worthy end. Work wants worth. Easily the most daunting challenge I face is the apathetic teenager, one who is disheartened, disengaged, or likely distracted by something much more appealing: Clash of Clans, Fortnite, Snapchat, the latest memes — what have you. How can I possibly design a curriculum that conquers instant gratification? Especially when this content stands to be delivered no matter what (as it is a “standard”) and students have no choice in coming to the building? Perhaps the place to start is figuring out why teenagers love these activities. Teachers tend to jump to conclusions — that these ideas are dumb, lack brain cells, or are pointless, often forgetting the presumed retroactively viewed-as-silly behavior they engaged in. I believe engagement like this is valuable — it offers something teenagers are missing. People don’t engage in behaviors en masse unless they’re deriving pleasure from it that they can’t access easily somewhere else. What do they offer? Community, belonging, commonality, entertainment, and friendship: they’re all activities that anyone can enjoy, engage with, and bring people together. Just like sports or box office movies, games like Fortnite and Clash of Clans are the go-to way to connect with your friends. It is on rare occasion that students solely “zone out” — they want to be around others doing the same thing — it’s social behavior (or in some cases, a desire for social behavior such as via social media). Therefore, the place to confront these possible barriers is to change how our engagement looks — if students want attachment and a feeling of belonging, we must build a curriculum which fosters that. A school built on trust — real trust — that listens to student input, allows them to take control of initiatives, and directs itself on their interests, will lend itself to learning. We must stop pulling our hair out — or worse, punishing and demeaning students who would rather do what they enjoy — and restructure what a modern curriculum can be. If we judge, control, and limit them, students will no longer see our points as authentic nor justified. It’s not a place for learning, it’s now a prison. I struggle with any label placed on gamers or phone users — “they’ll never amount to anything”; “that’s all they ever do”; “can’t they just live in the real world?”; “they’re going to rot away doing that.” etc. Although addiction is incredibly serious and we must be steadfast in acknowledging that — it’s rare in comparison to the assumption that students are addicted to their screens. It’s because they’re not engaged, not because they’re incapable of letting go. I should know — I spent most of my formative years playing World of Warcraft, Counterstrike, and The Sims. I don’t regret any of it — I built friendships, learned about graphic design and computer coding, learned valuable skills of compromise and leadership, and how to manage my time so I could meet bare-minimum requirements at school. Throughout, it wasn’t that I couldn’t detach myself — it was just my detachment was more engaging — more connected — and more purposeful than anything school would offer. This is common — 40% of online video game players say they play to escape the real world. This may an element of addiction — but I see it as a problem of what our world is offering. There is no sustainable focus on children to find their calling. An aside question of “What do you want to be when you grow up?” or “What college are you planning on attending?” does little to spark the imagination. Despite the overhanded use of “job-readiness” in schools — this takes the form of qualifying a workforce of boring, uninspired pupils that can master Algebra II and AP British Literature rather than people who are clamoring to work passionately. If I have nothing to connect to — nothing to works toward in the first eighteen years of my life — what’s the point? Disillusionment is the natural result: children work toward the next-step without qualifying why they’re taking the next-step. As William Deresiewicz notes, they’re zombies. And after they realize how far removed they are from a meaningful life, they become grossly disengaged. Anxiety and depression rates are rising at alarming levels — doubling in the last 30 years. Coupled with less certainty in every arena: political divisions, economic worries, lack of a safety net, higher divorce rates, and “tougher standards” in schools — there shouldn’t be any surprise: our world is a scary, uncertain place. However, as teachers we have so much control in helping to change this narrative — even if it’s only for the short period of time in our room, it matters. If we’re okay with our classroom being a place that is entirely based on relationship building — meeting students halfway — and meaningful connections to content and student agency — then we’re designing a path for purpose. Meaningful time, coupled with learning that attaches to student aspirations and experiences, will begin to establish meaning. And that may sound contrived, but there is a worrisome lack of meaning across almost everything in middle school and beyond. Initially, these changes will be hard — it’s not what students expect: the class will be less structured, less competitive, and therefore “not as serious.” And it wouldn’t hurt to make our classes fun as well — interesting, sure — but there’s nothing wrong with enjoying the space you’re in. Overtime our consistency in making connections — loving students — will give rise to a community which is what we were all looking for in the first place. The logical conclusion many teachers come to is to pair what students like with their traditional coursework: make a meme of neuroplasticity! ; how would this Fortnite situation be calculated? I applaud any educator willing to meet students in their space, but endeavors like this tend to simply rationalize a system of control: get students to do the work we want by manipulating what they like to do. And as a result, our outcomes are short-term and marginal — the lesson may go well, students may be incredibly excited that day, they probably will learn a lot. But this isn’t a sustainable practice, because our content isn’t what students are always doing — and we can’t pair an entire subject area to Fortnite. We’re just updating to Teach Like a Champion 3.0 — finding new ways to dish out antiquated work. Our ability to design a better future is based entirely on our willingness to completely change how our classroom works. To design meaningful experiences, we shouldn’t look at ways to pair our curriculum (usually, it’s a stretch anyways). Instead, we should be creating a curriculum that is engaging to students in the first place. Children want to learn — they care about knowledge — just not what we’re giving them. The only way to find out is ask — help guide their journys — and build a better, purposeful future together. When your classroom doesn’t look like any other classroom — students are often overjoyed, but also bewildered. Why would I do anything when it’s not for a grade? If they’re not going to lecture, why wouldn’t I just goof off? If there’s not a test, is any of this information relevant? Educators face this scenario daily: by doubling down on progressive practice, their unwillingness to embrace the traditional delegitimizes their class. In most schools, there is a small cluster of teachers thinking different — they’re letting students run their experience, they’re stepping back from the front of the room, they’re rethinking grades toward legitimate assessment, and they’re not cramming state-mandated standards. When a student reaches these classes, there’s a stark shift: no forced respect, no falsely perceived narrative of what one “needs” to know, no grades. This is a frustrating scenario — schooling has made many students unaware of what schooling should be. It’s not about them — it’s about passing a test, scoring top of their class, and dominating the ever growing college resume checklist. After all, students are essentially holding everything back. It could be that the majority of each day — a very draining day — that teachers are beholding them to notes en masse, harsh solitude, and mind-crushingly boring topics. So yes — if you give students a break, let them be kids, and give them a lot of exciting things to do…they’re going to get really excited. It’s obvious when you reflect on it. However, in the moment it’s a grim reality — all of these well-researched frameworks are just turning my room into a circus! It’s a challenge — and one that I’ve learned to love: educating children who have to come to school without forcing them to learn, and the majority of the time they’re ruled in other rooms. Every single year I deal with a sizable minority of students who will play video games in the corner for weeks — completely adverse to any content — because “well, it’s not for a grade, so I don’t care, I hate school!” I don’t shame or blame them, it makes sense. As a high school educator, I’m well aware of how ridiculous some (even most) of the content students are tested over is. While in this classroom, respect is earned, not given. That’s usually something teachers say to children — but it should be the other way around. We’re earning the respect of them — convincing them that we care, appreciate, and love them — that we want to guide their journey toward even more positive outcomes. To accomplish this, I talk a lot about school. We have passionate discussions on what a grade really is, how sarcastic comments by teachers hurt their feelings (after reading through Alfie Kohn’s ‘Corridor Wit’), the history of our classrooms, and what our goals at school should be. Most students love this (they’re finally able to trash talk school!) and they’re also willing to give me a chance. There’s something to be said about being the “popular teacher” — often equated to the “easy teacher” (more on that later) — it shouldn’t be a contest, but when students see you legitimately as a trusting, caring individual who understands their situation — they’ll do what you suggest. And there’s a few who struggle to get there — students completely disillusioned will take weeks — even months — of one-on-one conversations and sparks of interest to participate. But all of this is better than the alternative: forcing them to care. After all, it would defeat the entire purpose of educating for positive change if you force them to. It’s worth noting that “4.0 students” seem the most prone to rejecting a progressive mindset. My most daunting challenge are the ~20% of students who complete homework, read for other classes, and “get ahead”, rather than explore ideas in my class because it’s “not real” without a traditional playbook. For me, outside of just building solid relationships, the only solution is to design the most absurd, relevant, and over-the-top PBL scenario: designing works to help the community and having every professional I can think of come in; raising awareness for the undocumented laborer program who was willing to visit our classroom; building and designing mock rollercoasters for a local theme park contest. If the classroom is doing legitimately fun, relevant, and interesting work — everyone tends to jump on board. And ever present in any scenario in my classroom — students can opt out. Interestingly enough, the more I’ve given opportunities to not participate, the more participation I’ve gotten in return. When your classroom knows you’re doing all this for them, they’ll stay by your side. Furthermore, letting students guide their path instantaneously makes your classroom relevant. I always mention that if you want to do something different, just ask! This leads to a lot of interesting — and not always fool-proof ideas — but that’s sort of the entire point of teaching. We’re here to guide, mentor, and assist through learning…which includes failure and ridiculous ideas. Therefore, it’s not uncommon to see kids doing a lot of frankly bizarre things in my classroom: building a life-size Barbie doll box, writing a (not-so-well researched) play on drug usage in the United States, or researching local golf courses and their impact on our community’s economy. These might seem random — but they’re all relevant to learning the history of our area. And each leads to a learning opportunity: why not connect this Barbie doll box to the exoticism of Human zoos of the 19th/20th century — this time related to body image and the role of women? ; why not connect with a member of the local police to learn more about the opioid crisis? ; why not make a proposal of how golf courses can improve the economy, and see why our lower-income areas never seem to have them? Each one of these micro learning opportunities sparks a unique desire to engage and foster a purpose to these projects. Making connections to deep points of understanding in history, such as the horrifically racist Human zoos of the 19th century, are easily connected and synthesized when connected to student’s experiences. Motivation feels different. You have to know your students. Sadly — this gets conflated online to knowing their names, greeting them at the door, or recognizing them on their birthday. I would hope the majority of educators show basic human-to-human interaction with people they spend hours each day with. Instead, by knowing students I mean you learn about their goals in life, what drives them, what small and large events have happened recently or in the future, their family life, their struggles and successes. It’s very complicated and time-consuming — but this is the entire purpose of education. If you spend all your time doing this, your classroom will transform. The bonds of trust will drive students to work with you rather than for you — they’ll see you as a mentor, not a military sergeant. And you’ll sometimes have to accept the situation you’re in as the progressive educator. There have been “free days” — where multiple tests were given in other classes, the day was long, it’s frankly just “boring” today, etc. “Let’s doing something small, or nothing at all, and play a few games. Spend some time with each other and talk.” Doing this may make you the “easy teacher” — but really you’re the teacher forming bonds. The break is just as important as “core class time.” I’ve never had as much engagement — in serious discussions or free play — after our class has just bonded together and relaxed. Learning communities aren’t entirely formed by “learning” together, at least not in the traditional sense — we form these communities by learning about everything: social interactions, getting up and moving, doing something entirely random, and of course — coursework. Rebranding learning in the classroom is a necessity. Without doing so, you’re setting yourself up for failure. I know far too much teachers who attempt progressive ideas and give up after a month — the kids were too rowdy and well, rebelled. Mistakes will be made along the way, but the fight to implement progressive education will take a lot of unorthodox classrooms, willpower, and commitment to positive relationships. Once you double down and lead the way, you’ll reap the rewards. If the goal is to unite everyone for a common cause, let’s rally together: “We all work everyday doing what’s best for children.” “We care about kids.” “We work tirelessly for our students.” Frankly, I’m tired of statements like these. It’s the perfect copout to any argument, a safety blanket for failing at innovative practice. There’s a fact at the end of the day: either one adopts practice backed by strong research, the cutting edge of what we know works for students — or they don’t. The status quo is not good enough, and although we all — assumably — care about students, that isn’t enough to satisfy drastic change. At almost any conference I hear those words at an attempt to get everyone on board and accept mediocrity. It’s easy to keep doing things as they’re done. If one is taking the easy way out (and knows better), are they still doing what’s best for kids? What if they’re wishfully ignorant? Demanding change is a different beast than desiring it. We can hypothesize and read book after book that present equity in education, gradeless learning, student-centered schedules, interest-based ideology, restorative justice, and critical pedagogy — but to enact it requires many to fall in line. Teacher autonomy is only as strong as the pedagogy that supports it. We expect that everyone does their research and works their hardest, but of course that’s not always the case. There are people that are right and wrong about their classrooms. And yes, only you know your students and that drives practice, but there is often a grandiose assumption of what this means and an unnerving connection to a teacher’s already developed curricula. Not all educators are exemplary — the act of going into this profession and doing whatever (even if you’re putting forth huge amounts of effort) should not make one shielded from criticism under the guise of heroism. If educators aren’t united and constantly pushing forward — together — then two or more schools will exist: one that has teachers reimagining the classroom and the others doing decent work. Sure, one can do traditional well, but that doesn’t mean they’re doing what’s best for kids. Of course, this comes across as insulting — but I don’t think it should. Toxic positivity envelops education, we aren’t allowed to critique those in our profession without attacking “heroes.” In the same way that those attempting to reform the criminal justice system are judged— those critical of educators are seen to attack core principles of humanity itself. Essentially, a leader should not waver to banal statements to make everyone feel safe. In the same way a band shouts the current location in their concert, releasing a quote that celebrates all teachers, regardless of what they’re doing, is guaranteed to gain support of the crowd. But there’s many issues — a degree of uncertainty and risk is a central tenant in progressive education and some will achieve while others falter. However, a safety manifest in staying safeperpetuates traditional teaching which is not what’s best for children. Is it wrong to criticize an educator who actually isn’t doing their best? Perhaps it’s the combination of lack of respect and constant judgment that leads many teachers to celebrate these ideas. Endless pressure from the superhero mentality (which I’ve previous written about) has poisoned many to the point of giving up and, understandably, generic positivity helps foster support. Culturally, any teacher without consistent positive reinforcement would almost have to be doing incredibly poorly. None of this is meant to assault well-to-do educators or imply that all choices I’ve made are correct, but to simply stop the dialogue of “everyone is doing their best for children.” I don’t think we should buy that — if everyone is doing their best, then what’s the point of any change? Wouldn’t we constantly be pushing toward separate outcomes? Doesn’t one — or even a mix — of sides have to be correct? We must stop coming to terms with easy, comfortable argument conclusions and keep up a constant stream of doing better. “Best practice” is defined as keeping politics separate from teaching: avoiding personal viewpoints, remaining neutral, and listening to all sides. It is ironic that the place most adverse to political influence is a cornerstone to literal constant discourse and indoctrination. The majority of educators — especially those who teach Humanities where these discussions tend to take hold — firmly believe they shouldn’t showcase their beliefs nor let students have any inkling to what they are. It is my view that we should do the exact opposite. That isn’t to say that teachers should brainwash students to single-sided stories, rather it is irrational to teach from neutral footing. Frankly, to remain neutral is a single-sided story. One can’t teach without bias. In every curriculum, choices exist which fundamentally form a biased viewpoint: book selections, discussion questions, test prompts, project ideas. Indeed, the choices encouraged by the state (how many standards reflect certain perspectives over others, which selections are “best” for children) are heavily invested in by political voices. To remain neutral is to accept the status quo. As a history teacher — if I quietly take my state mandated medicine and remain neutral — I am explicitly defining the historical narrative as an event-to-event story with little pushback, a few (hand-selected, safe) minority voices, and a series of wars with their benefits. Little attention is paid to those who fought against corporations and the military (socialists(!)) nor really any voice discrepant to the annals of the victors. It’s saddening and more so, frightening that bringing up feminism, understanding Wallace Fard Muhammad, or analyzing our current political situations to those of the past is “taking a stance.” Perhaps I misunderstood the entire point of learning our history, but I would assume that the application of our knowledge — recognizing historiography and the debates it entails — while simultaneously providing a view to the historically oppressed — would be the point of history class. Taking a “stance” by presenting more of the story is just good teaching, not politicizing. Furthermore, in the same way most news media accepts all positions — a teacher who “remains neutral” in a class discussion suggests that all student opinions are factually the same. However, some positions are more correct than others. This is not rejecting student voice or promoting a political stance — it’s educating. Isn’t the purpose of education to inform? Facts, figures, and data is valuable and we must ensure that students can not only have informed opinions, but recognize that some issues aren’t debatable — for example: institutionalized racism is a problem in the United States, undocumented laborers are people often fleeing horrific situations, and there is a violent gun problem. None of these topics are political — but the fear of bringing up something serious, something that matters, is so foreign to the milquetoast education system. It fractures the “safety” of the “neutral”, perfectly laid out curriculum that assumes little is wrong, no problems are still present, in society. Likewise, we shouldn’t accept prevailing notions of “safe teaching” as politically uncharged. In English, consistently teaching “classics” (the vast majority written by white males) exacerbates an often disregard for reading among those disillusioned with this hidden narrative and refuses to acknowledge current literary works discussing problems today. A simple note of this is The Hate U Give by Angie Thomas being banned in multiple school districts. Cited as “inciting sexual behavior” and its “rampant” use of curse words, these same districts are fine with Adventures of Huckleberry Finn. It seems likely the concern is on the book’s critical viewpoint of racist police violence. Again, this is inherently political — but by ignoring The Hate U Give and staying safe, we are being political by blindly passing off the work. These stances are often deemed “radical.” To recognize actual problems in the world and talk about them is somehow “far out” while making bland, single-sided trivia lessons “engaging” through over-the-top lessons is “being a passionate educator.” In no way is this implying that all schools should take a liberal stance, although it is noteworthy to recognize many of these issues have a liberal slant — but just introducing critical discourse to any topic makes automatic relevance and importance. Much of this is a fight against the hidden curriculum — a rejection of the assumption that what we’ve always done is neutral, correct, and historically upstanding whereas any new idea is outlandish. Authority and conformity is easily trained when learning is passionless and, for most of the time, pointless. If students never see relevancy — e.g. have any foray to why what they learn matters in the real world — then how can we expect them to apply it? A “good citizen” is one who readily accepts what they’re given — someone who rigorously plays the game of school to function happily as an ignorant “academic”. Therefore, we can’t assume that when one introduces a problem to the classroom that they’re a “radical” — they’re just doing their job well. Students are questioning the world around them, they’re questioning authority, and they’re engaged. What else could we want? Students love school the first day and begrudge it the rest. Teachers plan their beginnings to be engaging, then “get to work.” Isn’t it odd how easily this aligns? When a child is not forced into endless, substantiated curricula and learns about their peers, moves around, and is excited to be there — they’re engaged. Perhaps the most egregious claim made by traditional educators is the equation of work and learning. “If you want to succeed, you need to put the time in!” Of course, the implication is that any success in life is due to a 4.0 GPA, perfect attendance, and a “do what you’re told” mentality. Most define learning this way — even subconsciously. Often I’ll find myself telling students to “stay on task” without recognizing the hidden message that I’m managing workers, not leading a community. The connection between labor and learning is as obvious as it is damaging to everyone. A child begins to see imaginative, creative thought as “extra work” and adults are slow to pursue taxing new endeavors. What used to be a place of wonder, a classroom is a production center. When adults come across a row of books, they think of the time commitment and workload rather than the mysteries that are kept inside. In reality, we’ve conceded that learning is not energizing — it is the antithesis, something categorically lumped in with doing the dishes. Sure, many teachers believe their commitment to fostering engagement, but how many of us reinforce workplace policies and terminology? Get to work, be on task, sign in on time, don’t fall out of line, ask questions (but don’t waste our time), do everything you’re told to. To imagine a place beyond this is actually quite difficult — would a compulsory public school be able to “control” without these policies? Is “control” — the center of workplace protocol — inevitable? Why do almost all students show up day one engaged and ready to learn? Many are happy to see their friends — but there’s also a willingness to try something new, a desire to go beyond a 24/7 life with one’s family. It’s a new opportunity, a new community and space to explore. No matter how many times they’re let down, I find students excited on their initial return. Therefore, public school educators are assigned a difficult endeavor — we must create a learning community without corporate foreboding…when our children did not agree to be there. How can we redefine our classroom? Let’s reimagine how we view learning. Even the most apt teachers still see their “course load” as such. Not a lot of interesting things, but myriad work. First, that mindset must change. An educator goes into their room to inspire through passionate claims and a desire for their students to change the world. Instead of day two being a return to reality, why not develop a place where we fight to keep day one spirit alive all year? But being passionate is just the start. A spirited teacher without any changes to traditional protocol is essentially a master of manipulation — they find ways to make children learn. Engaged teaching is more “fun”, but results are a mixed bag if they actually makechildren learn more (Motz et al., 2017). However, when we begin to change systems, we truly enact change. A substantial change relies on shifts. A movement from tests to creative assessment, grades to feedback, standards to learning, compulsion to inclusion, production to community. Each is in opposition to the desires of the mainstream traditional framework. Realistically, it is impossible without masking the components of what’s really going on in your classroom. After all, if you didn’t hit 80% of “your content” and had zero grades in the books, what would a principal think? Imagine a start to the school year where, with a circle of new acquaintances, you develop the baseline expectations for the room. Together, you discuss and form the basis of your class, explaining your expertise but provide decision-making to the room. This serves as your community, and as a collective you organically move from interest to interest — providing ample time, discussion, and freedom to move and explore, taking steps forward and backward. You still factor in interesting activities, readings, and projects — but it’s a result of what your students are interested in that day, not something predefined. Everyone doesn’t always agree, but there is time for self-expression as well as communal compromise. When grades are due, you assign everyone an A (or if that’s too noticeable, let students self-report.) When it’s standardized test season, give a “crash course” on test skills. (Students will perform shockingly well with no content knowledge, which should provide a solid basis on why these tests are ludicrous.) When an administrator is present, throw in a lesson plan — students are always observant in the atmosphere of an observation. The change that’s central to all this is trust. It’s relatively easy to dismiss all protocols of traditional education and “cheat” the system. There’s rarely someone actually keeping track of what’s going on day-to-day — as long as test scores remain relatively normal and no one is screaming in your room, it’s all fine. A real barrier is recognizing that you’ll trust children enough to do this. You must innately believe that students desire learning, will work without commands, and care about their education. 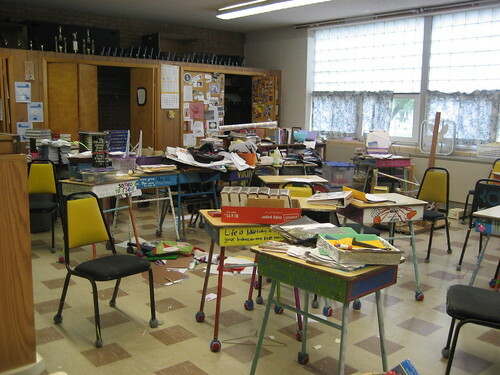 The negativity that surrounds most teacher workrooms would wholly communicate that we can’t. They’re rowdy, they don’t listen, they’re “low”, they won’t do anything. As prefaced, they are not willing to “work.” But in this radical shift, would students revolt without control or morph into a learning collective? Recognizably, not all are going to comply without forced compliance. Removing the reigns will allow a complete rejection of authority and a chance for these students’ voices to be heard (often for the first time without being instantly silenced.) We mustn’t be afraid of critical voices, thought, and actions when we create a space that desires exactly that. It would be futile to imagine a community of learners who are open to expressing their ideas while simultaneously expecting that they all never reject the compulsory nature of their experience. This isn’t a sign to give up, it’s a sign to formulate more ways of building community. We must listen and compromise, not reject and control. A community is something lost in schools — a faux sense of learning has gone the way of completing as many tasks as possible to please an ominous government-mandated presence. We must recreate the adage of “work” and push toward authentic thought.